If you use RS-485 on CH2 you should config to disable echo back if you are not disable it when you send data with G.Output there are data echo back to your RS-485 port because you connect RDA to SDA and RDB to SDB that cause G.Input Error. Then you should disabled echo back follow with this topic below. Mr. Wasan, May I know is the signal reply timing will affect the result too? Because I saw there is some adjustment of the time of feedback signal. Is the timing of feedback will affect the feedback signal in my PLC? & Is there any command in Q series plc to calculate the CRC value for RS485? 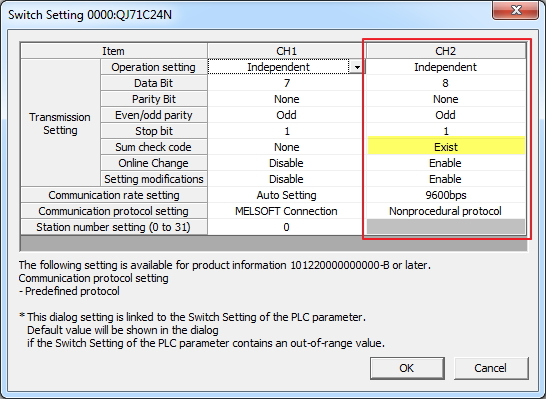 Then go to Various_Control_Specification and Select echo back on CH2 to 1:Prohibited and download parameter to PLC. 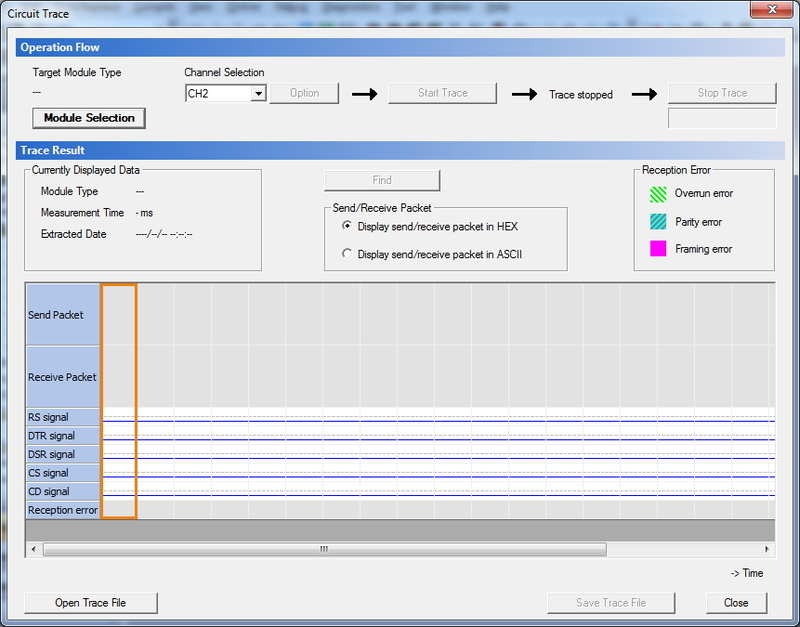 Select Module and Channel then start trace and try to send/receive data it will collect data until you select stop trace after stop data frame will be shown below. Regarding this point it is not defined which CRC you need. I'm pretty sure that the built-in CRC are ment for the MELSEC protocol and not when using "NonProcedural Protocol". In other words you need to write the CRC yourself. I might have some examples written in GX IEC Developer or GX Works2 (don't remember). Also, the topic starter is using ASCII and not binary, are you sure you are looking for a CRC (and not a sumcheck)? @KY WONG: Which CRC do you need? Do you have a spec? But for ASCII comunication just terminated string with <CR><LF> (H0A0D) it will collect data to buffer by G.INPUT function. @kaare_t I wish to understand about the checksum. For your information, my ASCII Modbus device is using CheckSum8 Xor. Is there any PLC code can generate the Checksum for it? For your information, now I temporary off the function of checksum in my device function. 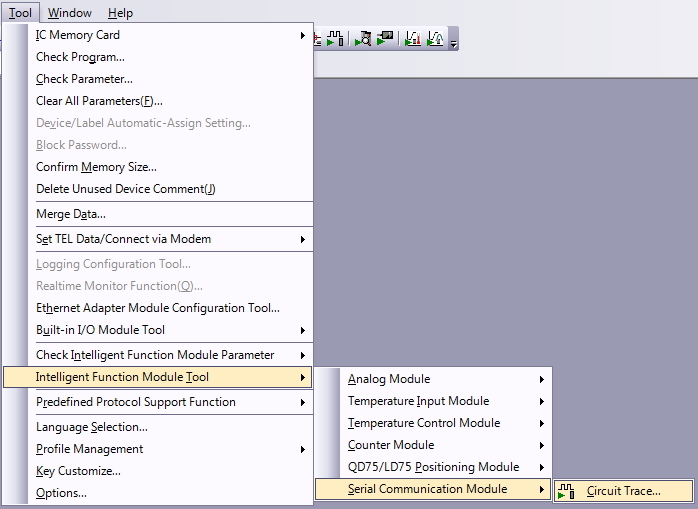 Before this, I have used the FX PLC RS485 communication (RTU modbus format). As I know there is a PLC code to generate the CRC-16/Modbus. Is the Q series having the special code to generate the CRC too? @Wasan My device end code is <CR> only. It mean that my receive complete code specification setting is 13(Dh) right? The entire received input will go to specify buffer memory right? Yes, you could change terminate string from 3338(0D0Ah) to 13 (0Dh) at Various_Control_Specification in Receive completion code specification. @Wasan I have adjust the setting of echo back function. However, I still get the echo back in my input. Is there any setting I need to adjust? Please show your circuit trace. Maybe your PLC version is lower than use in configuration but you can direct access to buffer about this. Please follow as below thread. @Wasan Here is the setting of my plc and the code of PLC program. @Wasan I have just get 1 more issue. What is this mean? Do you have this experience before? @KY WONG: Regarding CRC, you mentioned that you needed to write a CRC check in code. Why? In the "Predefined Protocol Function" , CRC is automatically applied to both outgoing and incoming messages (see last line in picture). You should re-enable CRC on your peripheral device, and also use CRC on the Q. I would recommend using binary encoding also. @kaare_t & @Wasan thanks for helping me to solve the problem. I am grad to meet you here. Thank you very much.